I’ve been a proud Teardrop travel trailer owner for a month now and I’m thrilled to say, this is one of the best ideas I’ve ever had. After 7 years of housesitting and living on the road, it’s so wonderful to have my own space! The advantages of Teardrop camping have been even more obvious this week in not-quite-spring Colorado. After a few hot weeks in Utah and a few warm days in New Mexico, my first night in Colorado at Great Sand Dunes National Park was downright frigid! Fortunately for me, the Teardrop is insulated and I was quite cozy. In the middle of the night, I awoke to icy flakes pinging the outside of the Teardrop and I remember thinking, “sounds like snow!” Sure enough, when I opened the door in the morning, the Great Sand Dunes were dusted with white! Not a lot of snow, but enough to swell Medano Creek into an icy river! Usually, this creek only flows for a few weeks in the spring; the rest of the year it’s a dry channel. 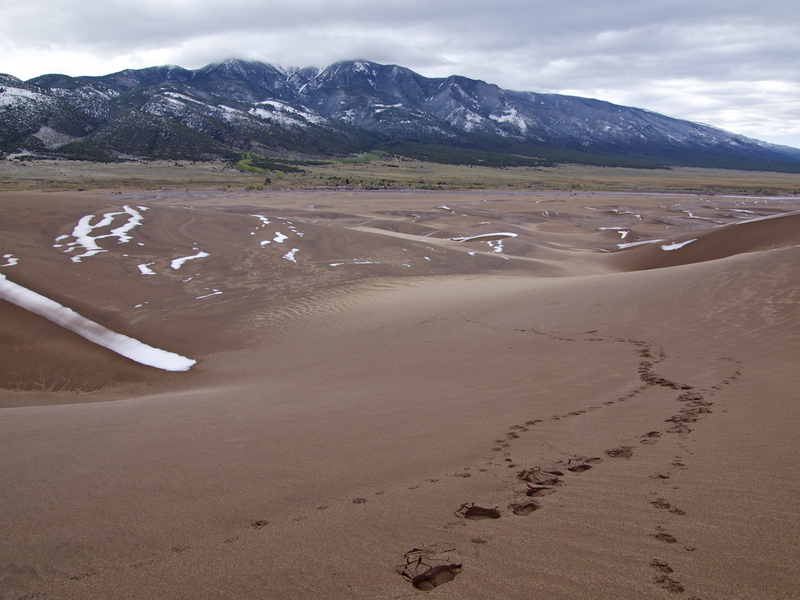 Those few flowing weeks, however, are key to the existence of the Great Sand Dunes: the creek carries sediments out of the mountains and deposits them on the floodplain southeast of the dune field. Prevailing westerly winds then blow the grains back into the dunes, where they pile up against the barrier of the Sangre de Christo mountains. 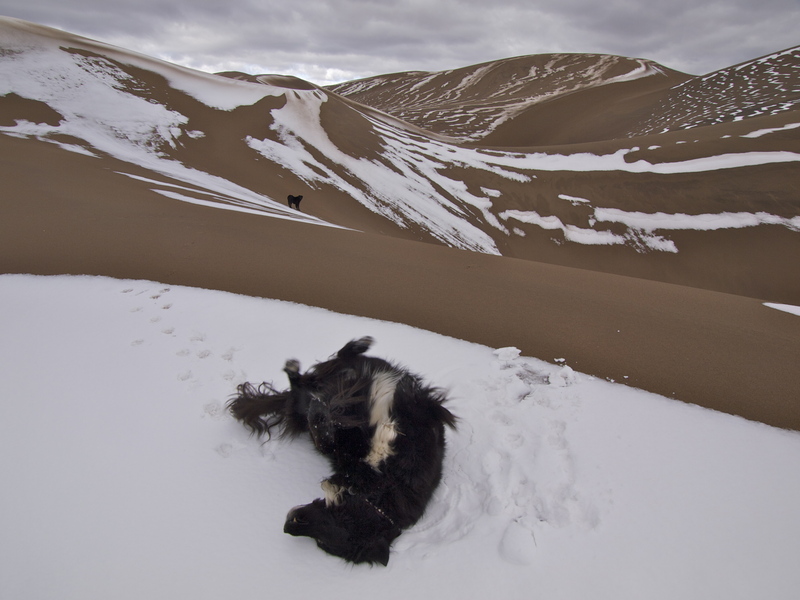 Over millions of years, this seasonal cycle has created the highest sand dunes in North America. 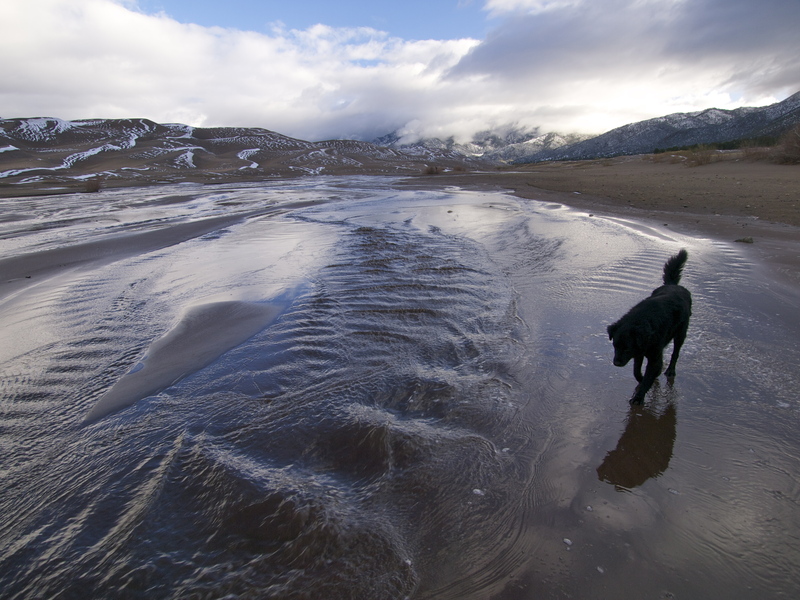 Swollen Medano Creek was beautiful – I’ve never seen a landscape of mountains, dunes and water – but it presented a very chilly challenge: I had to cross the creek to get to the dunes! It wasn’t deep, but it was fast and freezing. Crossing swollen creeks is always a little risky. Wearing proper footwear is key. Never go barefoot! I wore my water sandals across and carried my boots. My poor toes were painfully cold the rest of the hike! Both dogs made it across with no problem, although Bowie wasn’t thrilled to get his feet wet. The upside: we had the dunes all to ourselves! 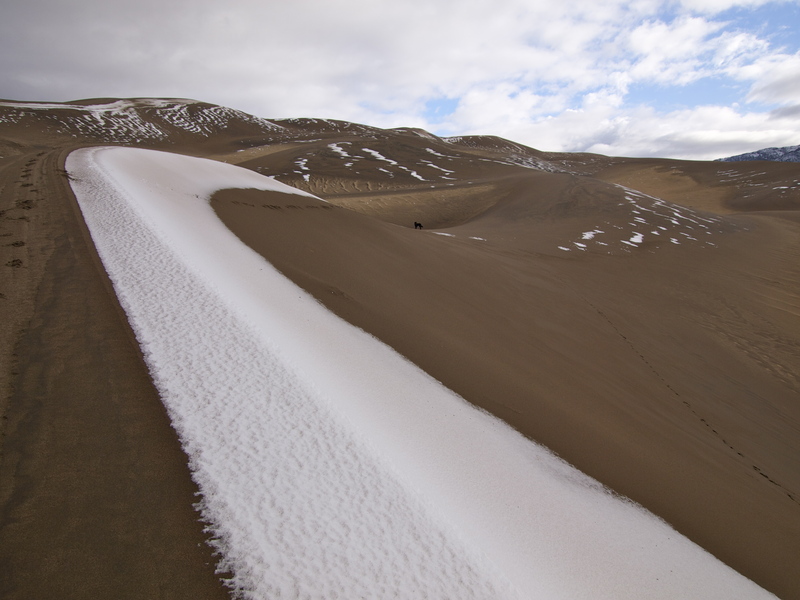 15 Responses to Snowstorm in Great Sand Dunes! solo is the best way to see dunes! Cool travels. Looking forward to following the journey. Wow. Love these shots. What a place. Hard to believe it’s the same country as Pittsburgh! Haha well it’s very far from Pittsburg! When we crossed Medano Creek, it was pleasantly mild-flowing and warm – and I waded across barefoot. But had to wear hiking shoes beyond, as the sand there is not at all like hiking (and even backpacking) barefoot in White Sands National Monument, which I’ve done several times.